Tide Selector Quiz helped me to “un-stink” the boys’ laundry. At any rate, I heard that Tide had something called the My Tide Selector Quiz and I clicked on it and took the quiz. 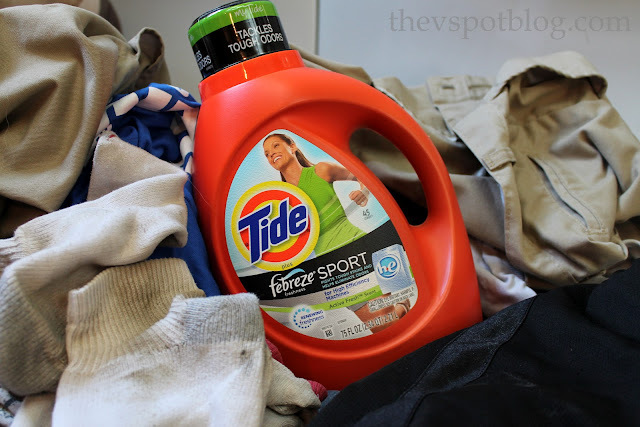 I answered a couple of simple questions and discovered that the best Tide to take care of our dingy whites, and stained, stinky boys’ clothing is Tide HE Plus Febreeze Freshness Sport. Some of the clothing I tossed in there was uber dingy, just from repeated washings where it never really got all that clean. These socks, for example. Just ew. While the Tide didn’t un-do the previous dinginess (since it had been really set in after repeated washing and drying) it got the new stains out. And it smelled great. It even smelled good when I opened up the washer to put the clean clothes into the dryer. No more stinky boy smell! 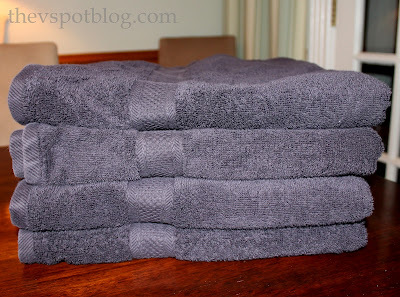 Even their towels smelled good, and they never seemed to smell fresh before. Now if I can just get them to hang up their towels after using them, right? I have to say that I am pretty impressed with the Tide that the My Tide Selector Quiz recommended for me. You should give it a whirl. From dingy whites to tough stains, Tide has a cleaning solution designed for any laundry needs. Need to eliminate odors from active wear? Looking for a solution that’s free of dyes and perfumes? Tide has a product to fit any lifestyle. Find out what Tide is right for you with the MyTide Selector. Disclosure: Compensation was provided by Tide via Glam Media. The opinions expressed herein are those of the author and are not indicative of the opinions or positions of Tide. Tide with Febreze is my favorite!! I grew up on TIDE. My mom uses it to this day! Your pretty towls make me want to see your bathroom. Baking soda and/or vinegar added to the wash are good for stink, too! I’ve tried this “formula” and it works really well for my workout clothes!